The Cuisinart Cordless Wine Opener with Vacuum Sealer pops open wine bottles in seconds, then seals them to preserve the freshness and flavor of unfinished wine. 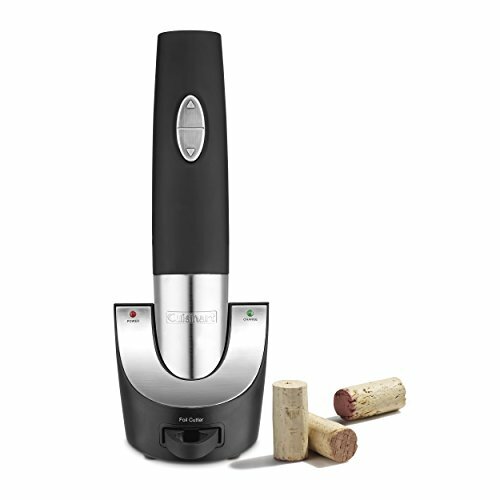 With cordless convenience, this reliable opener uncorks up to 80 bottles on one charge and recharges quickly. It powers through synthetic and natural corks without breakage - no more cork floating in the wine glass! A foil cutter ensures clean openings and drip-free pours, and neatly stores inside the charging base when not in use. Featuring easy cork release - just press a button to release the cork off the screw. Makes opening and vacuum sealing wines as easy and convenient as possible!